In honor of National Driver Appreciation Week, September 9 – 15, Pilot Flying J, the largest network of travel centers in North America, today announced its partnership with the American Trucking Association (ATA) on an educational outreach program. In light of the immense driver shortage facing the trucking industry, which may reach 174,000 by 2026 according to the ATA, the initiative is designed to raise greater awareness of the trucking profession and professional drivers’ tremendous contributions to our nation’s economy. Pilot Flying J will celebrate professional drivers throughout the month of September – starting today with the announcement of a $60,000 philanthropic gift to the ATA’s Trucking Cares Foundation to help support professional drivers and the future of the industry. Pilot Flying J will also reward drivers all month long through its annual 100 Million myRewards® Points Giveaway and 30 days of free offers in the myPilot® app. Behind the stocked retail shelves, fuel at the pump and expedited delivery of goods to consumers across the country, is an industry of more than 3.5 million American truck drivers that keep the U.S. economy moving. Pilot Flying J is honored to partner with ATA’s driver community to share their insights on the trucking industry and their passion for professional driving, with the hope of shedding light on the benefits of the truck driving profession to reach the future of the industry. In addition to driving awareness and appreciation of professional drivers, Pilot Flying J is thanking them in-store throughout the month of September with money-saving offers and giveaways. From Sept. 1 – 30, Pilot Flying J is giving away one free item each day in the myPilot® app, including a free slice of PJ Fresh pizza and popular drinks and snacks. 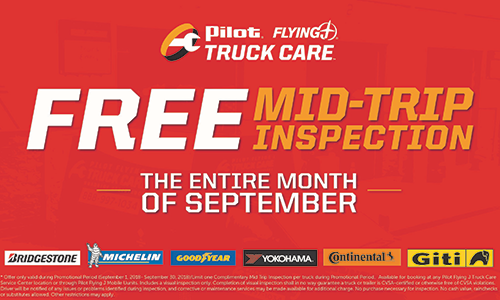 Pilot Flying J Truck Care is also providing free mid-trip inspections, a value of $50, to help professional drivers and trucking companies prepare for Commercial Vehicle Safety Alliance’s (CVSA) Brake Safety Week (terms and conditions apply*). Pilot Flying J will award prizes to more than 60,000 professional drivers, including 2,000 daily winners, during the 100 Million myRewards® Points Giveaway. To enter, professional drivers can simply swipe their myRewards® Loyalty card when purchasing diesel fuel at a participating Pilot or Flying J Travel Center in the United States. To learn more about Pilot Flying J’s September is Driver Appreciation celebration, sign up for myRewards®, or to find Pilot Flying J travel center amenities and locations, visit www.pilotflyingj.com. *Offer only valid during Promotional Period (Sept. 1, 2018 – Sept. 30, 2018). Limit one Complimentary Mid Trip Inspection per truck during Promotional Period. Available for booking at any Pilot Flying J Truck Care Service Center location or through Roadside Assistance mobile units. Includes a visual inspection only. Completion of visual inspection shall in no way guarantee a truck is CVSA-certified or otherwise free of CVSA violations. Driver will be notified of any issues or problems identified during the inspection, and corrective or maintenance services may be made available for an additional charge. No purchase necessary for inspection. No cash value, rainchecks or substitutes allowed. Other restrictions may apply.